This day-by-day diary of The Other Half’s live, studio, broadcasting and private activities is the result of two decades of research and interview work by Bruno Ceriotti, but without the significant contributions by other kindred spirits this diary would not have been possible. So, I would like to thank all the people who, in one form or another, contributed to this timeline: Randy Holden, Craig Tarwater, Ross Hannan, Corry Arnold, Mark Schroeder, Luis Futre, Michael Lazarus Scott, Mike Stax, Gray Newell, Gary A. Schneider, Los Angeles Free Press, Berkeley Barb, San Francisco Express Times, Michael Fennelly, Colin Hill, Jeff Salisbury, and Greg Prevost. 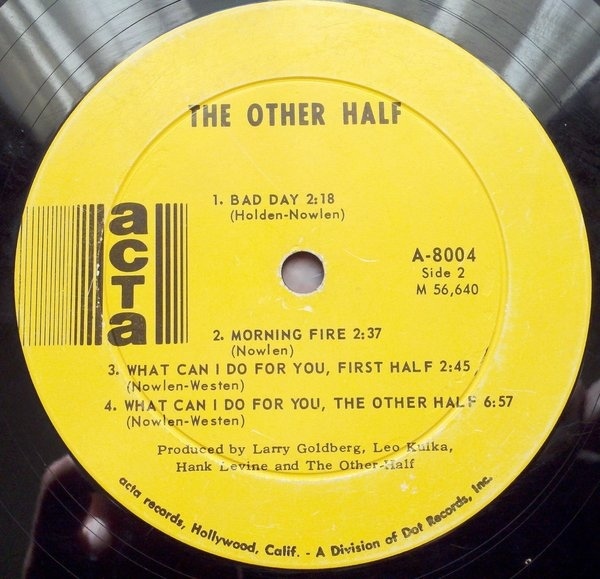 Undoubtedly one of the most underrated American garage-psychedelic rock bands of the late 60's, The Other Half were formed in Los Angeles, California, with Jeff Nowlen on lead vocals and harmonica, Geoff Westen on rhythm guitar and backup vocals, Larry Brown (b. 1943 - d. Friday, February 8, 2019, from heart attack after a Stent surgery) on bass, and Daniel 'Danny' Woody on drums. 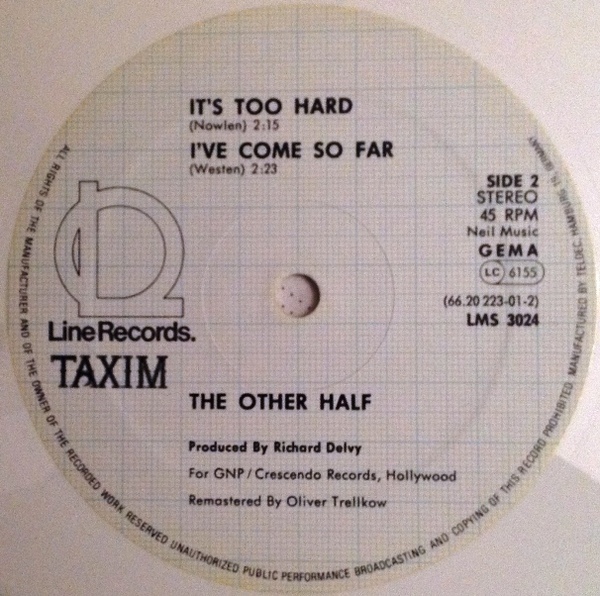 The Other Half's first and only gig with the four-piece lineup. 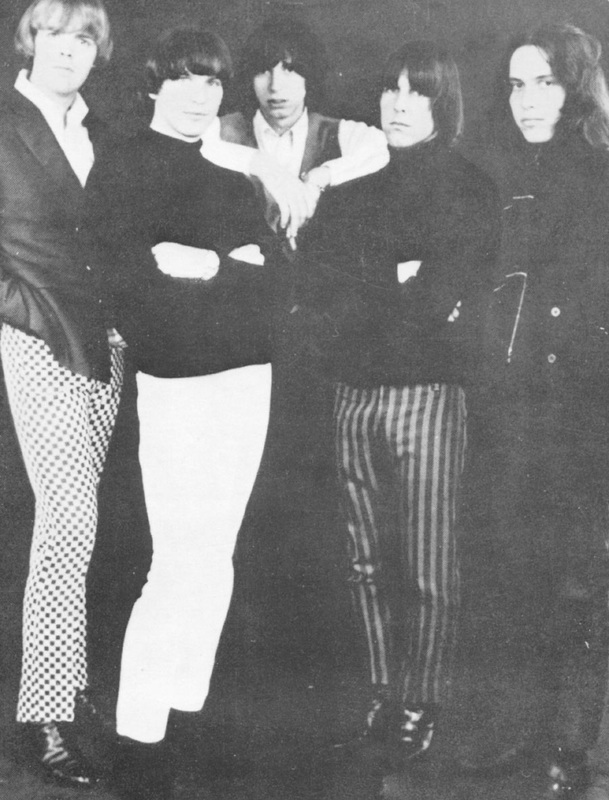 After parting ways with The Sons of Adam, and after turned down an offer to filling in for Jeff Beck on a The Yardbirds gig at the Santa Monica Civic Auditorium on September 7, Randy Holden joined The Other Half on lead guitar and backup vocals. “They were a new band themselves, a club band, played only one gig far as I knew. Very rough." Randy recalls on how he joined the band, "Somebody told me they needed a guitar player. I went to hear them. They weren't accustom to playing at high volume levels, but what impressed me about them was that they wrote their own music. It was difficult for the Sons of Adam to get together to write music. We always did it onstage. I did not want to play everyone else’s music anymore.” "I provided rehearsal place for the band for close to a year at my mother in law's home, which is where the music was written." Randy also recalls, "She actually fed the whole band during that entire time, cooking up a store. We even wrote a song called 'Mrs Wong's Kitchen' (didn't record it, it never fully came together as a song. Was a novelty, probably should have pursued finishing it. Had a good humor to it). Her name was Francis Wong, from her marriage to Wilson Wong, a Chinese scientist at Jet Propulsion Laboratory's Human Factors Division. He was a brilliant man. He taught me to play chess. I became quite good. He was the step father to my wife Georgene Luskovar, whose biological father was Croatian decent. An extraordinarily beautiful woman. We would visit her mother's home every Sunday, when Wilson would teach me chess. It took many months before I could even approach his level. Eventually I was able to best him. He and I use to follow the chess matches and moves published in every Sunday's Newspaper." 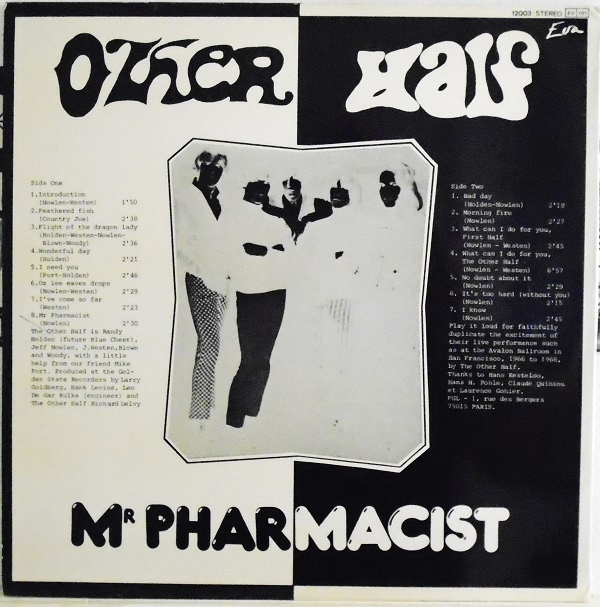 The Other Half's debut and only EP, 'Mr. 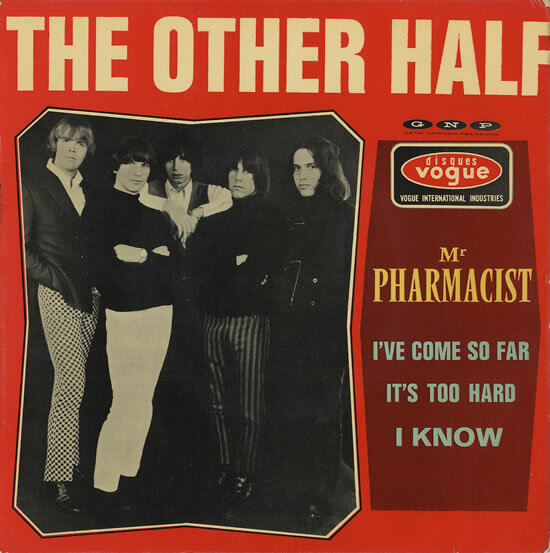 Pharmacist / I Know / It's Too Hard (Without You) / I've Come So Far' (Vogue INT. 18112), was released only in France. 'Mr. 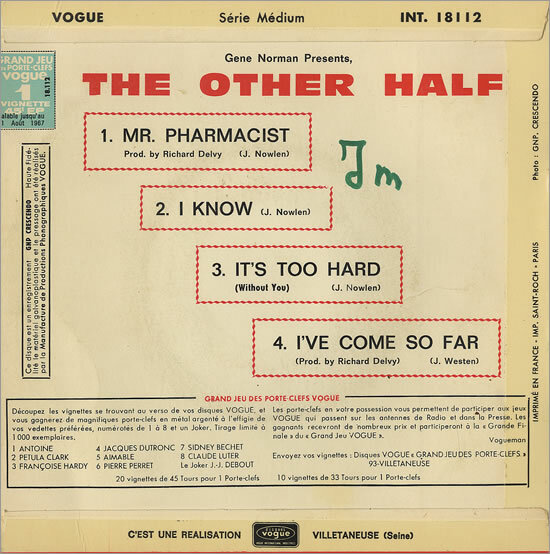 Pharmacist', 'I Know', and 'It's Too Hard (Without You)' were written by Jeff Nowlen, while 'I've Come So Far' was written by Jeff Westen (who also sang lead on it). 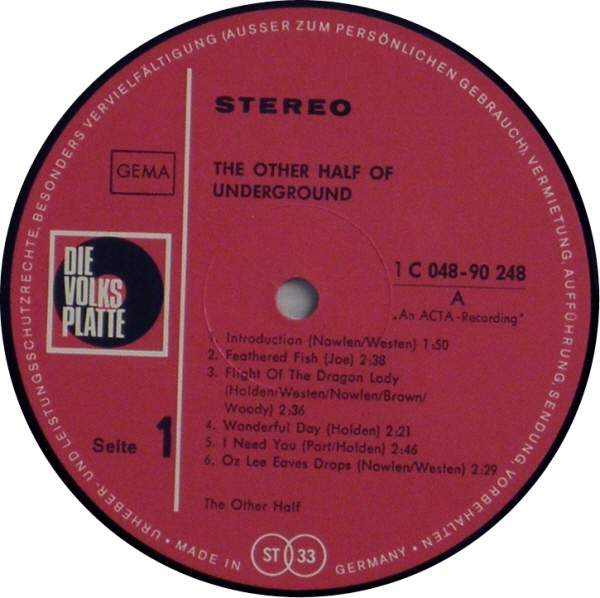 The extend play was re-issued (and re-mastered) only in Germany in 1982. By the way, according to Randy Holden, he actually co-wrote 'Mr. 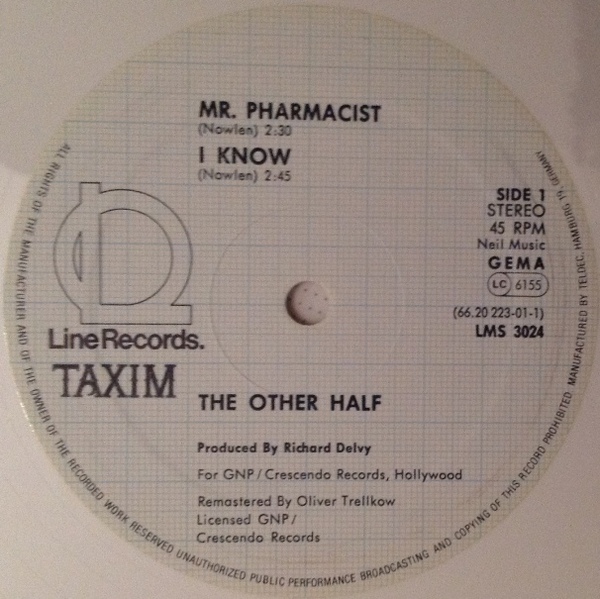 Pharmacist' with Jeff Nowlen, although he has no idea why he was omitted from the writer credits and copyright of this song. 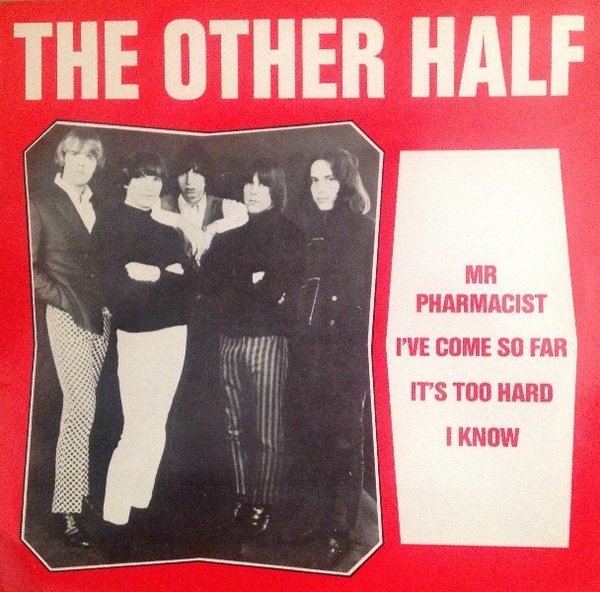 The Other Half's debut single, 'Mr. 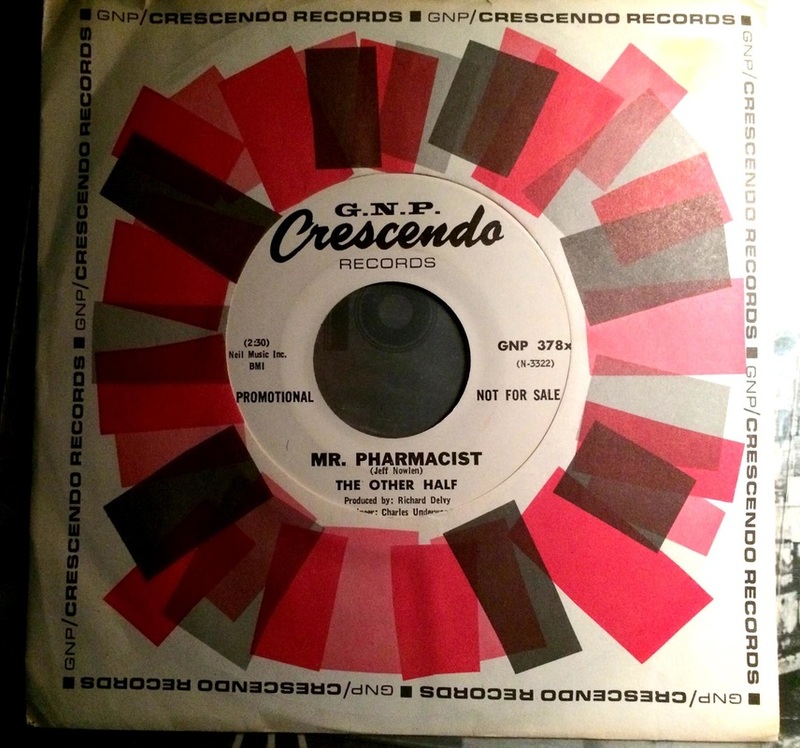 Pharmacist / I've Come So Far' (GNP 378X), was released only in the US. 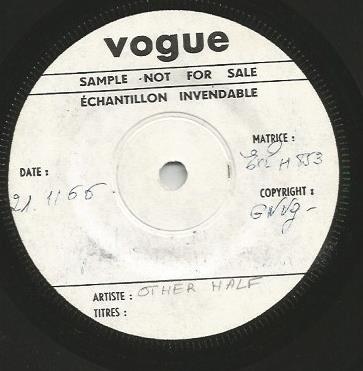 The single was produced by Richard Delvy, with Charles Underwood as sound engineer. 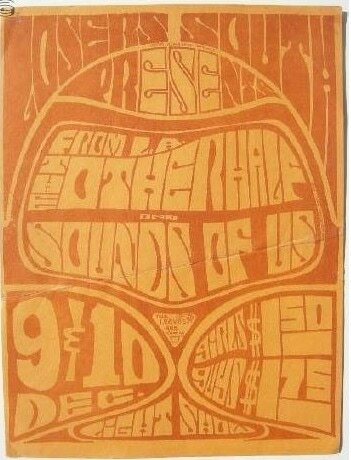 Also on the bill: Sounds Of Us. 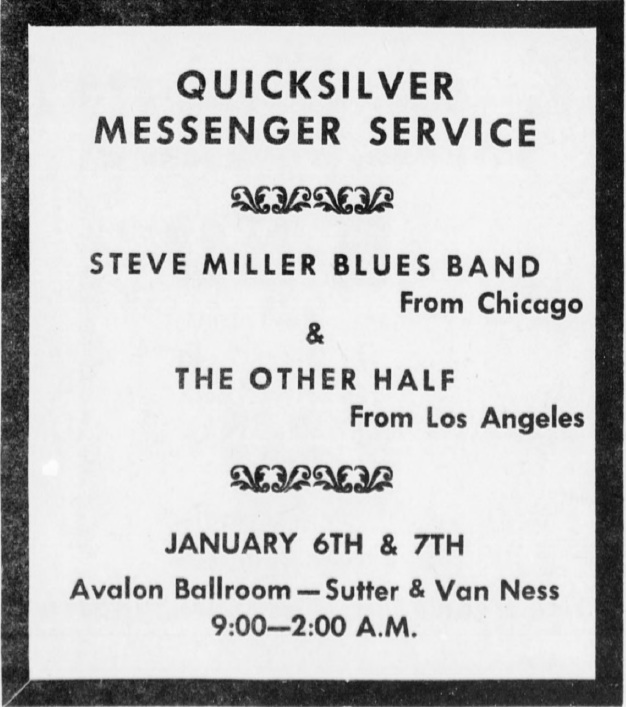 The Other Half opened for The Miller Blues Band, and Quicksilver Messenger Service. Lights by Ben Van Meter and Roger Hillyard. These shows, from 9pm to 2am each day, were promoted by 'The Family Dog Presents'. 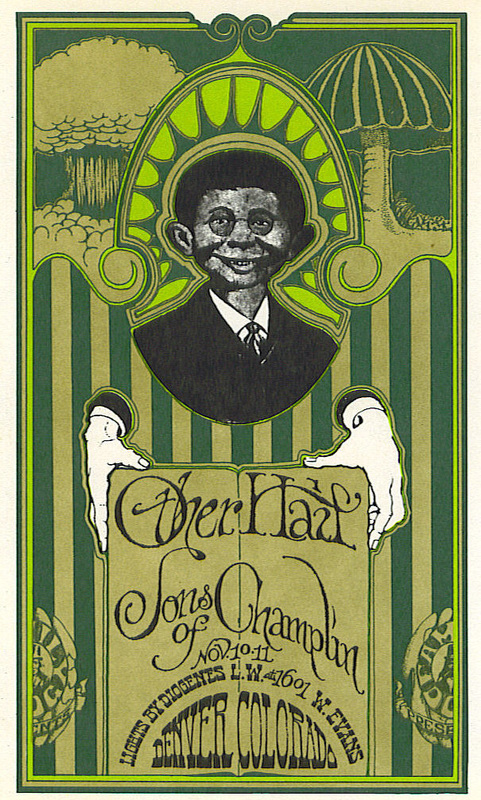 Randy Holden was invited to jam onstage with Steve Miller on at least one set in each of the shows. 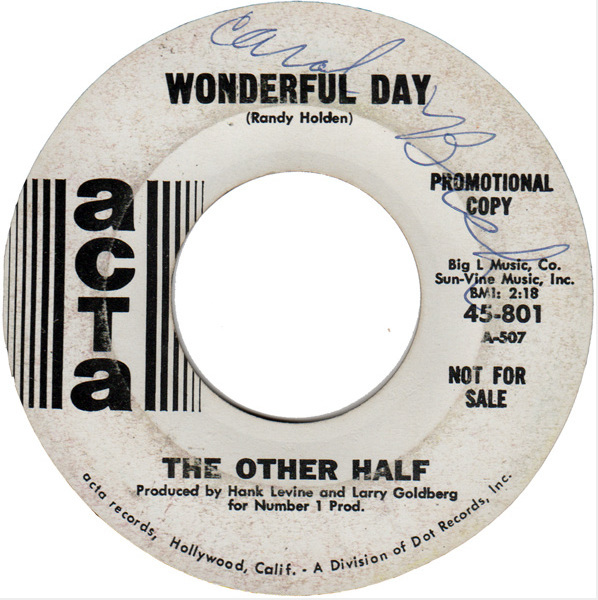 The Other Half's second single, 'Wonderful Day / Flight Of The Dragon Lady' (Acta 45-801), was released only in the US. 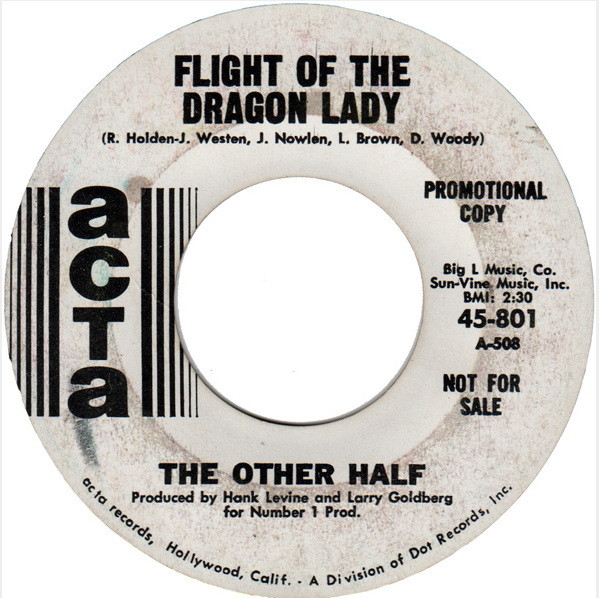 'Wonderful Day' was written by Randy Holden, while 'Flight Of The Dragon Lady' was written by all the five members of the band. 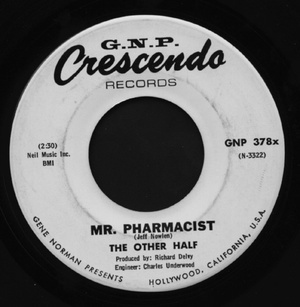 The single was produced by Hank Levine and Larry Goldberg. 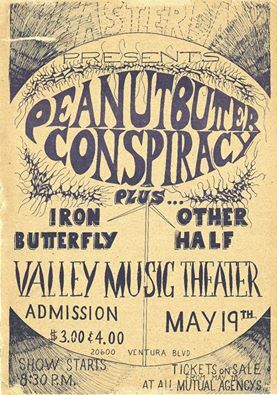 The Other Half opened for Peanut Butter Conspiracy, and Iron Butterfly. The show, which start at 8:30pm, was promoted by 'Yesterday presents'. 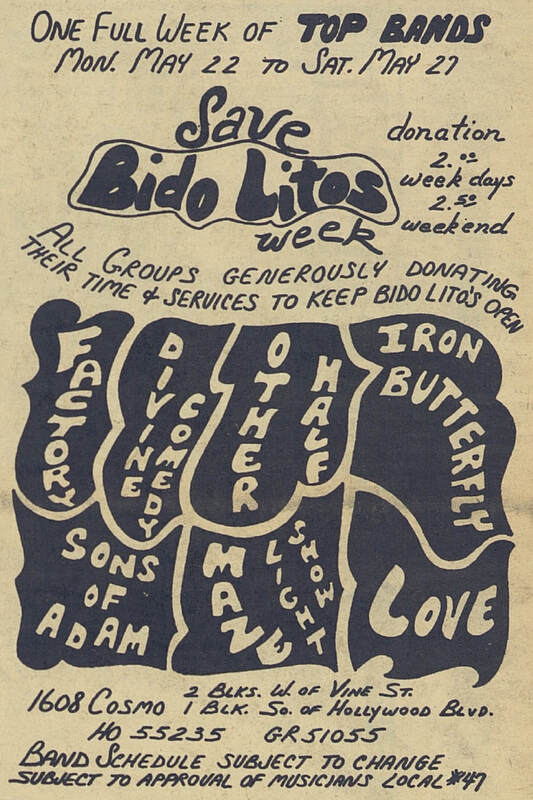 Other Half, Sons Of Adam, Love, Factory, Divine Comedy, and Iron Butterfly, generously donating their time and services to keep Bido Lito's open this week. Lights by Maze Light Show. 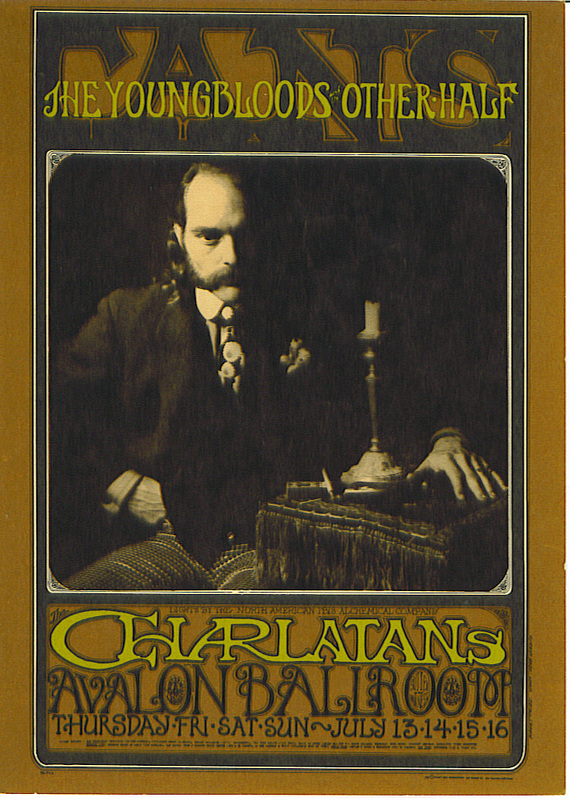 The Other Half were billed on the poster as opening act, although in the San Francisco Chronicle dated July 9, Emerald Tablet were listed instead, so this means that maybe The Other Half cancelled at last minute or at least Emerald Tablet filled in for them for one or more dates. 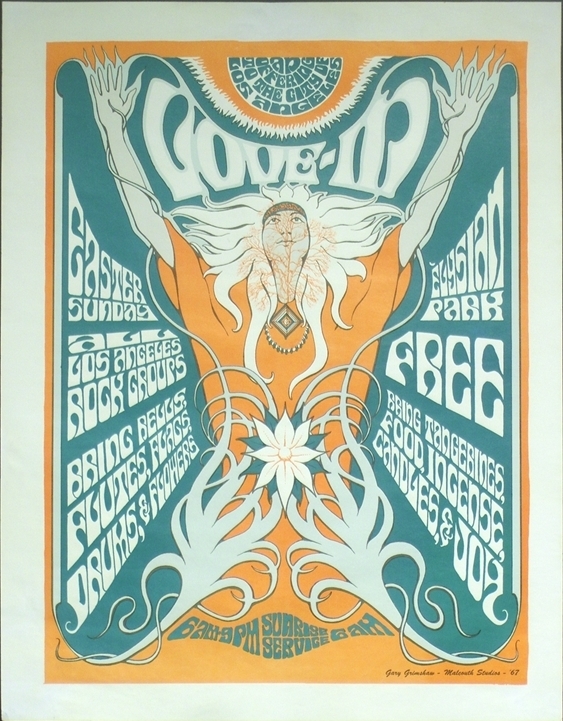 Also on the bill: The Charlatans (13-16), The Youngbloods (13-15), Arlo Guthrie (15), Wildflower (16). Lights by The North American Ibis Alchemical Company. These shows, which started at 9:00pm each day, were promoted by Family Dog. 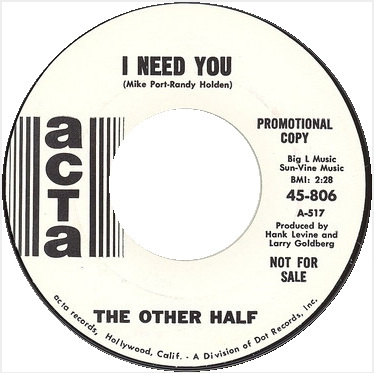 The Other Half's third single, 'I Need You / No Doubt About It' (Acta 45-806), was released only in the US. 'I Need You' was co-written by Randy Holden and his former The Sons Of Adam's bandmate Mike Port, while 'No Doubt About It' was written by Jeff Nowlen (actually co-written with Randy Holden, although the latter has no idea why he was omitted from the writer credits and copyright of this song). 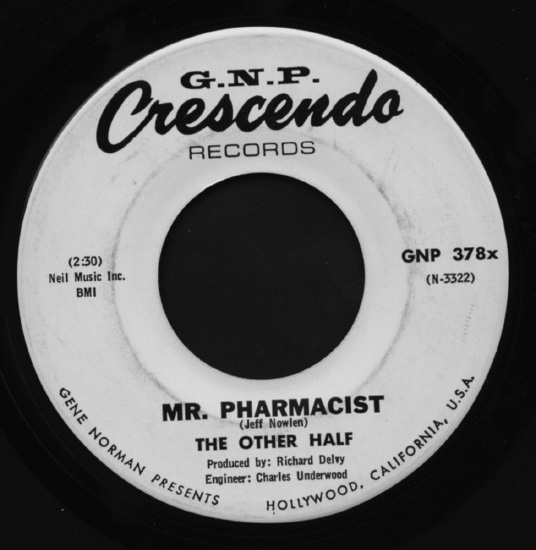 The single was produced by Hank Levine and Larry Goldberg. 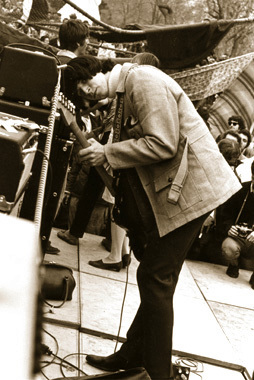 Danny Woody left The Other Half (he went to play with Hearts And Flowers, and then he played as sessionman on Jefferson Airplane's album 'Crown Of Creation') and was replaced by a new drummer called Ron Saurman. 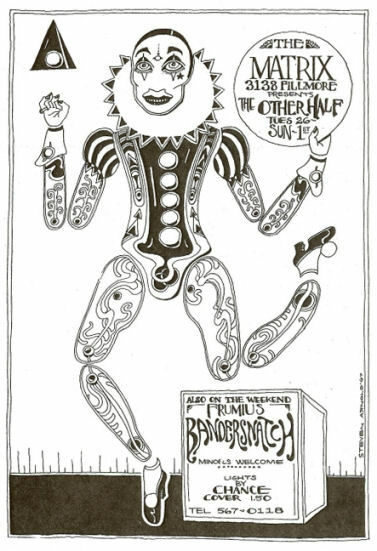 The Other Half opened for Quicksilver Messenger Service (17-20), and Melvin Q Watchpocket (17, 20). Lights by The North American Ibis Alchemical Company. The shows were promoted by 'The Family Dog Presents' and started all at 9:00pm. "I'd broke my foot at a previous gig a few days before." 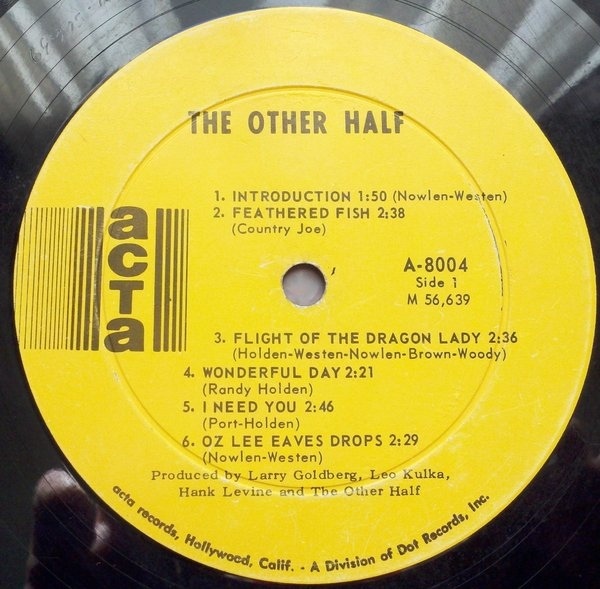 Randy Holden recalls, "I just came off stage from doing my solo thing and nearly destroyed my foot, only able to hobble. Janis Joplin was in the dressing room and I sat down beside her. She put her hand in my hair and fluffled it all around telling me what a great show I'd just done and she was very motherly, seeing my pain and gave me a Demerol for the pain saying, 'don't you have anything for the pain?' and I didn't, she said 'here, this will help you'. She was a kind little girl." By the way, Randy Carlisle, former drummer of The Sons Of Adam, filled in for Ron Saurman when The Other Half played at the Avalon Ballroom, maybe on these August shows, or maybe on the next September shows below mentioned. 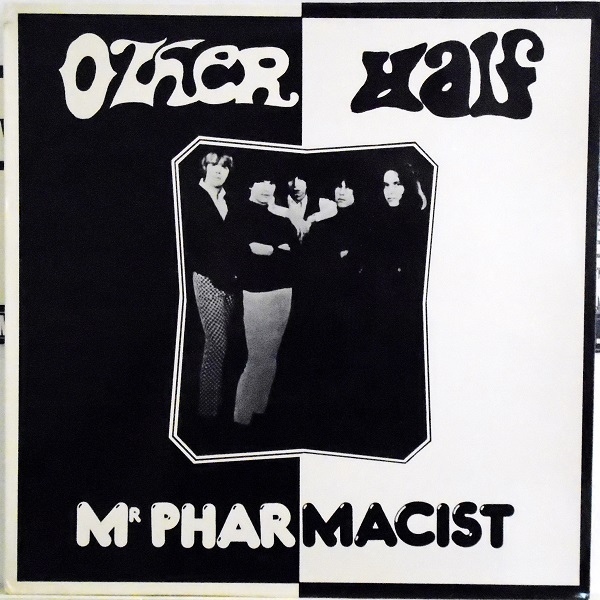 The Other Half opened for Mad River, and The Youngbloods. Lights by The North American Ibis Alchemical Company. The shows were promoted by 'The Family Dog Presents' and started all at 9:00pm. 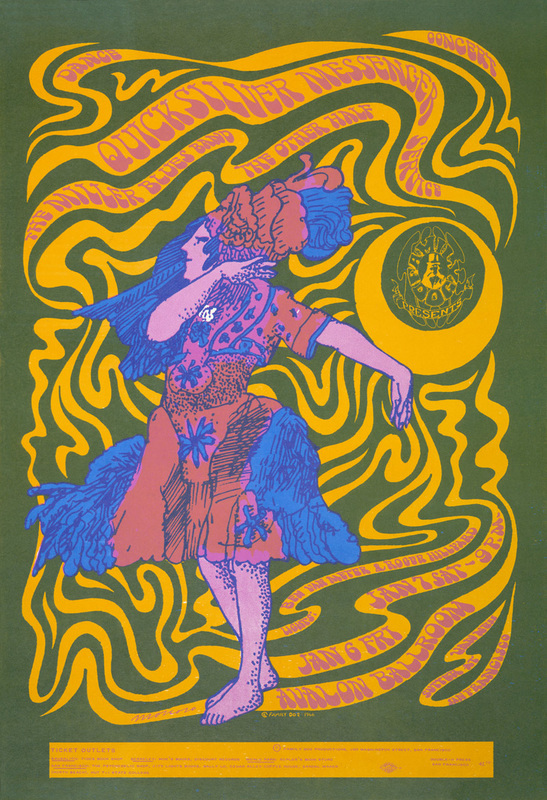 Randy Carlisle, former drummer of The Sons Of Adam, filled in for Ron Saurman when The Other Half played at the Avalon Ballroom, maybe on these September shows, or maybe on the previous August shows above mentioned. The Other Half were on the bill along with Freedom Highway (22-23), Peace (22-23), Illusionary Experaments By Dr P.H. 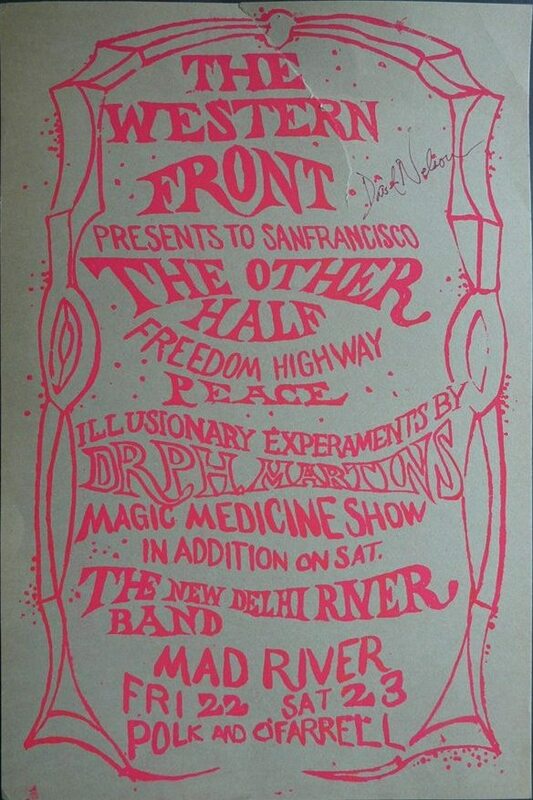 Martin's Magic Medecine Show (22-23), The New Dehli River Band (23), and Mad River (23). The Other Half were on the bill along with Frumious Bandersnatch (29-30, 1). Lights by Chance. 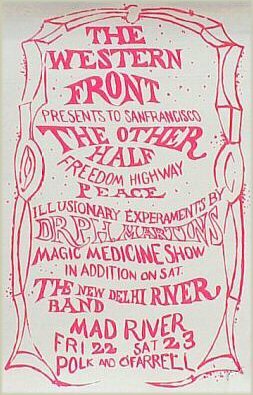 The Other Half were on the bill along with Blue Cheer, The Wildflower, and Eric Announcing. Lights by Clear Light Drive. 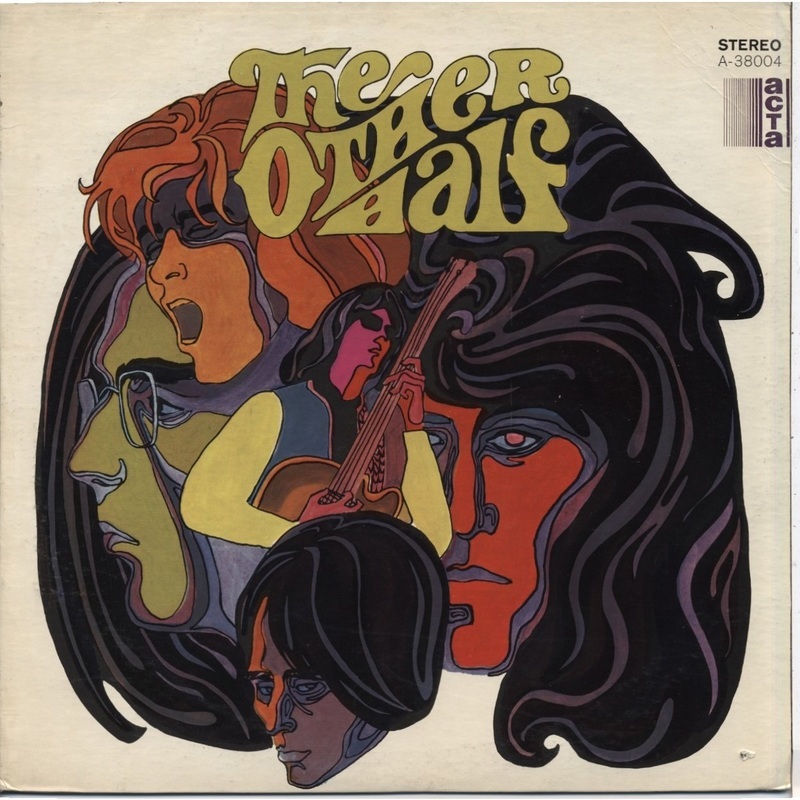 The Other Half opened for Jefferson Airplane. 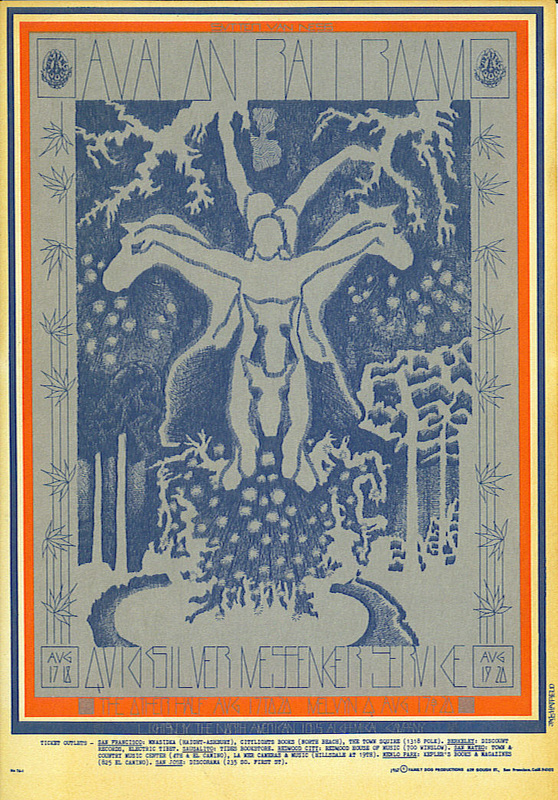 Lights by Diogenes Latern Works. These shows were promoted by 'The Family Dog Presents'. 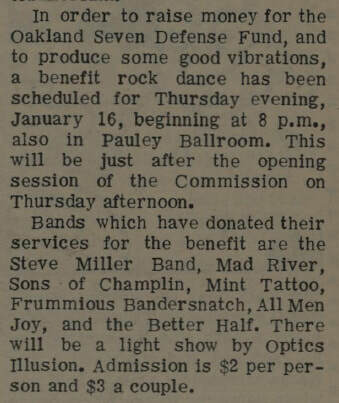 The Other Half were on the bill along with Sons Of Champlin. Lights by Diogenes Lantern Works. These shows were promoted by 'The Family Dog Presents'. 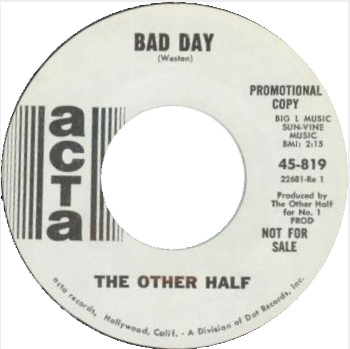 The Other Half's fourth single, 'What Can I Do For You / Bad Day' (Acta 45-819), was released only in the US. 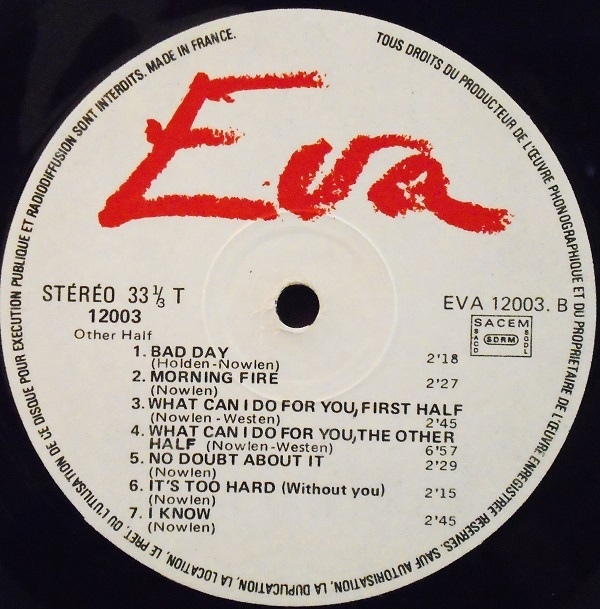 'What Can I Do For You' was co-written by Jeff Nowlen and Jeff Westen (and actually also Randy Holden, although the latter has no idea why he was omitted from the writer credits and copyright of this song), while 'Bad Day' was written by Jeff Westen. 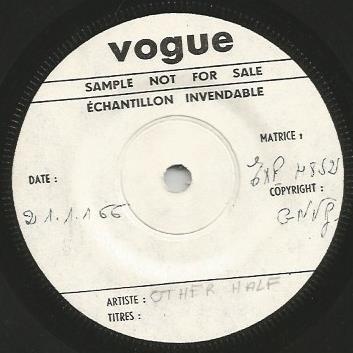 The single was produced by The Other Half themselves. 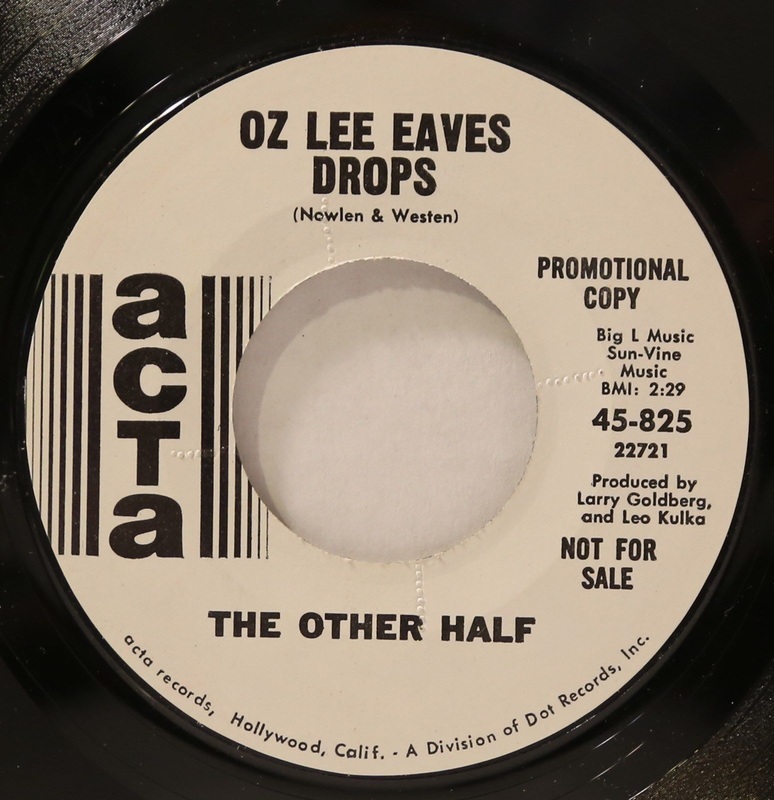 The Other Half's fifth and final single, 'Oz Lee Eaves Drops / Morning Fire' (Acta 45-825), was released only in the US. 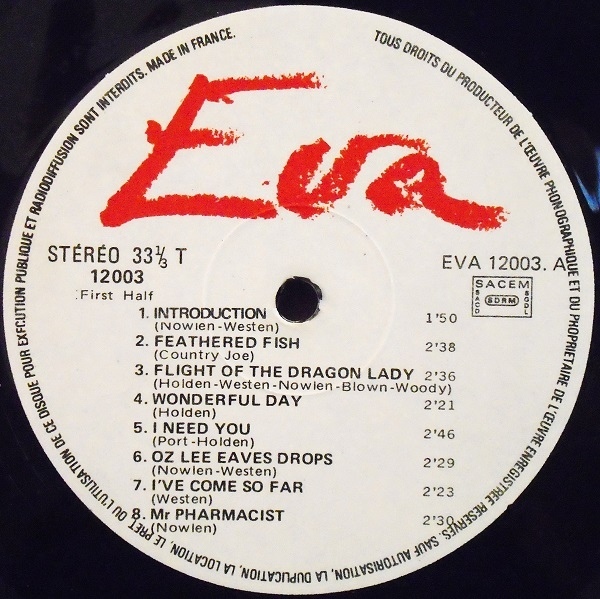 'Oz Lee Eaves Drop' was written by Jeff Nowlen and Jeff Westen, and was produced by Larry Goldberg, Hank Levine and Leo De Gar Kulka, aka 'The Baron' (the latter acted also as sound engineer). 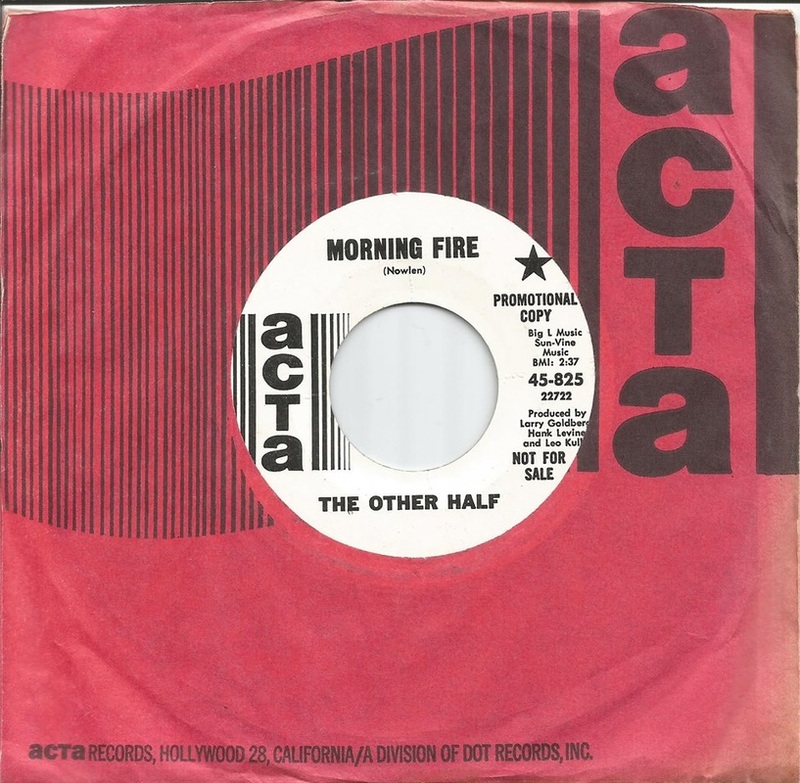 'Morning Fire' was written by Jeff Nowlen (actually co-written with Randy Holden, although the latter has no idea why he was omitted from the writer credits and copyright of this song), and produced by Larry Goldberg and Leo De Gar Kulka (the latter acted again also as sound engineer). 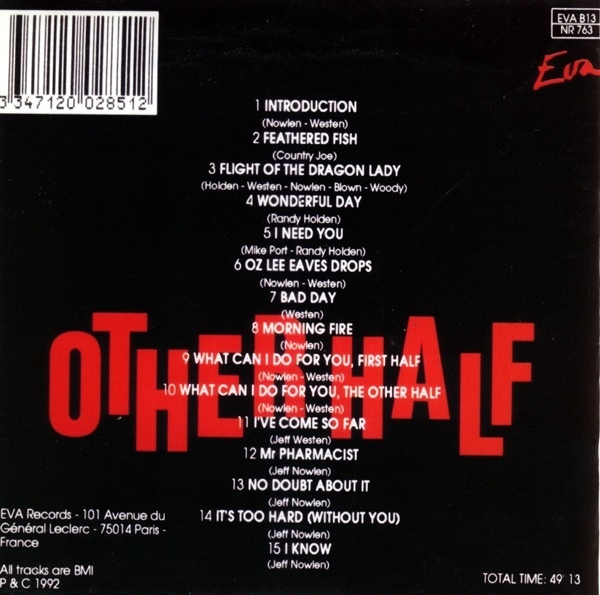 The Other Half's debut and only album, 'The Other Half' (Acta A-38004; tracklist: 'Introduction / Feathered Fish / Flight Of The Dragon Lady / Wonderful Day / I Need You / Oz Lee Eaves Drop / Bad Day / Morning Fire / What Can I Do For You, First Half / What Can I Do For You, The Other Half'), was released in the US. 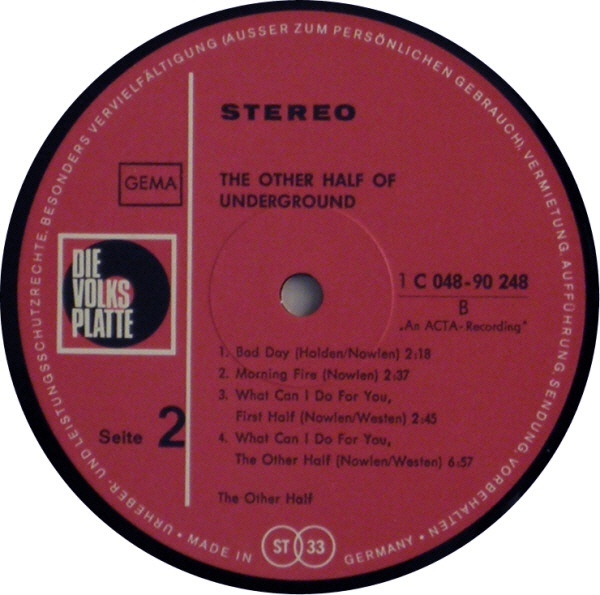 The album was also released in South Africa in 1968, and in Germany in 1969 (titled as 'The Other Half Of Underground'). The album was re-issued in the US and in the UK in 2004, and then only in the UK in 2012. 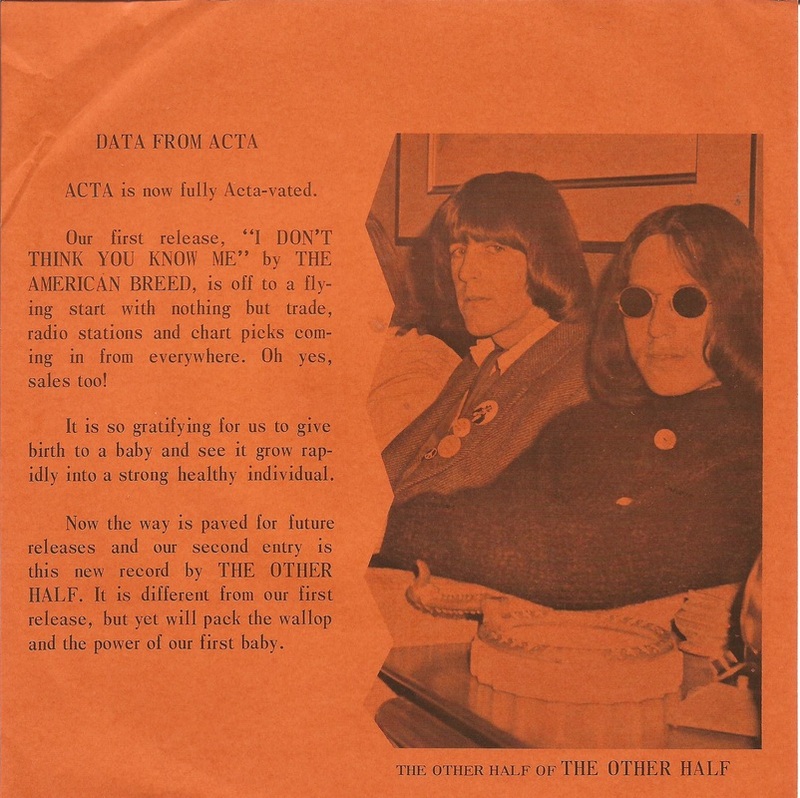 'Introduction' written by Jeff Nowlen and Jeff Westen, and 'Feathered Fish' written by Arthur Lee of Love (and not by Country Joe McDonald as wrongly credited on the label), were the only two "new" songs, because the others were already released in the band's previous singles. 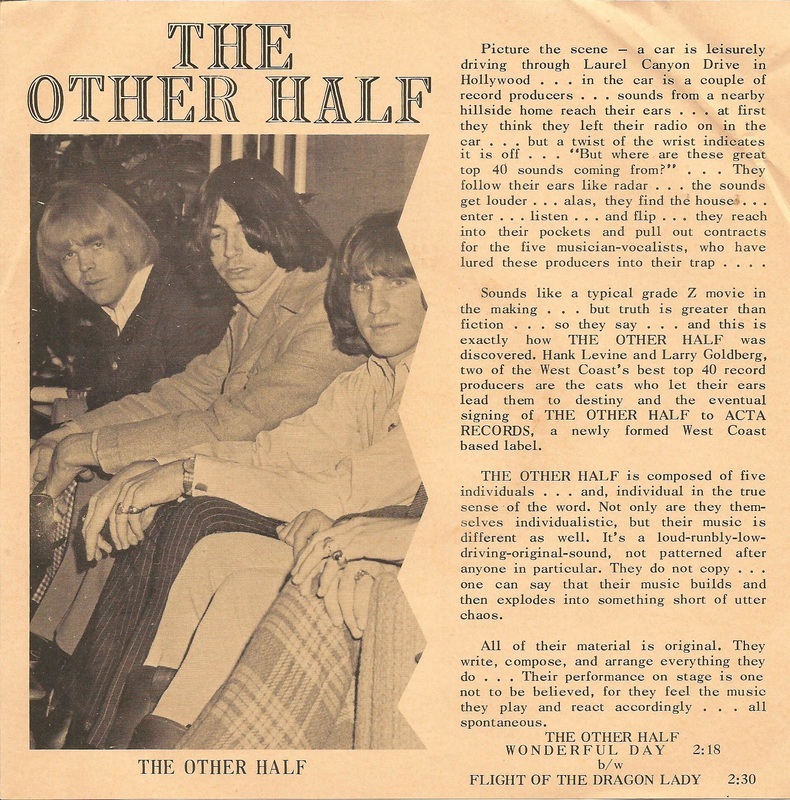 The album was recorded back in October 1967 at the Golden State Recorders, 665 Harrison Street, San Francisco, with Hank Levine, Larry Goldberg and Leo De Gar Kulka, aka 'The Baron', as producers (Kulka, who was the owner of the Golden State Recorders, also acted as sound engineer). 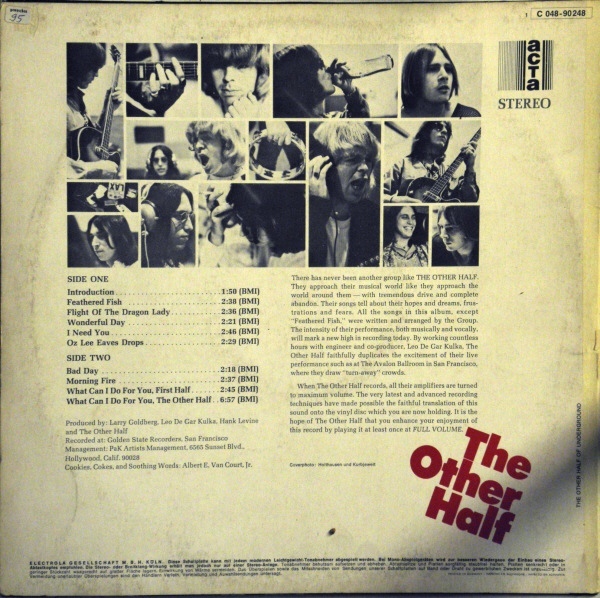 Randy Holden parted ways with The Other Half because he didn't like the direction of the band at that point. There was a lot of conflicts, personal conflicts, too. Anyway, the band replaced him with an unknown lead guitar player who was NOT Craig Tarwater as has been rumored for years. 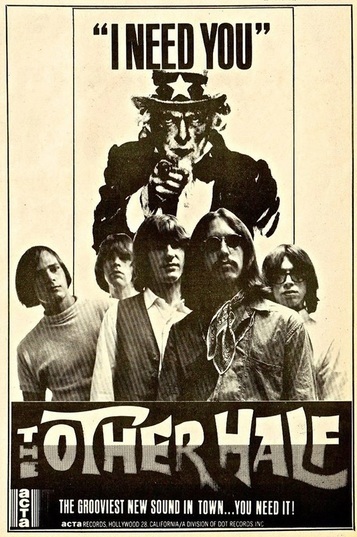 It was at that point that the band relocated to Mill Valley, a city in Marin County, California. 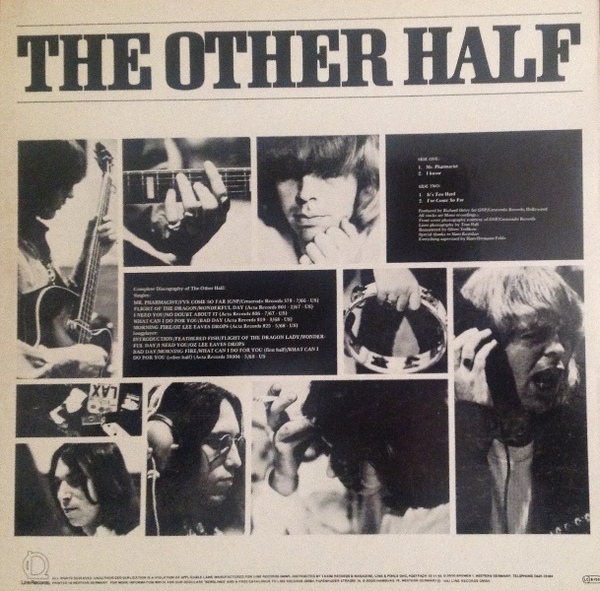 Apparently The Other Half recorded a second unreleased album titled 'The Other Half And How To Get It'. 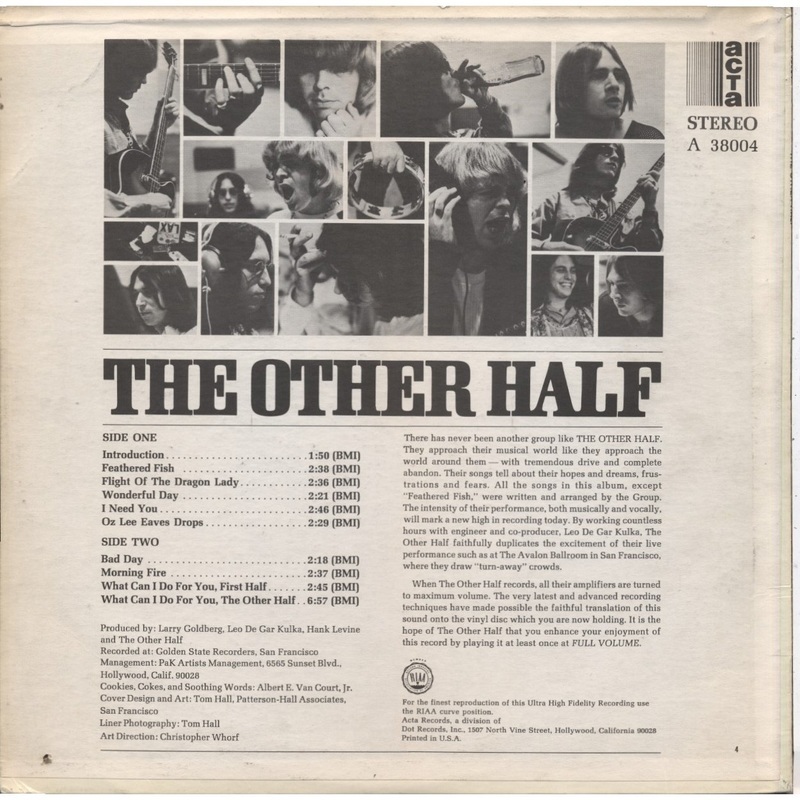 The band was wrongly advertised as 'Better Half' in the Berkeley Barb ad. 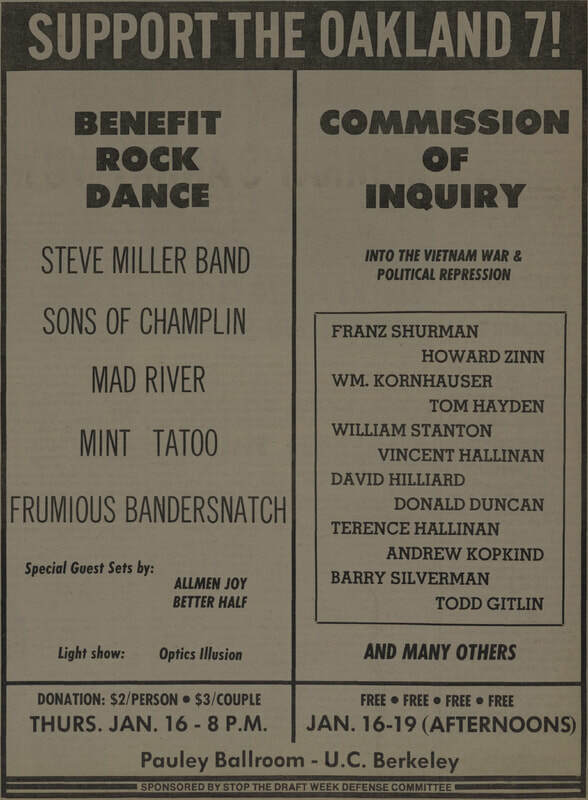 This concert, which started at 8:00pm and was sponsored by Stop The Draft Week Defense Committee, was a benefit for the so-called 'Oakland 7', a group of anti-Vietnam War activists arrested for allegedly conspiring to organize an illegal demostration in October 1967 (they were acquitted in March 1969). 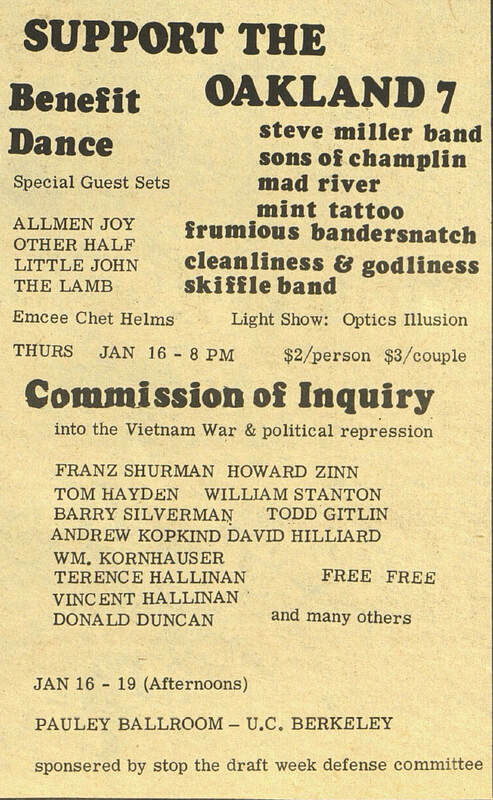 Also on the bill: Sons Of Champlin, Mad River, Steve Miller Band, Mint Tattoo, Frumious Bandersnatch, Allmen Joy, Little John, The Lamb, Cleanliness and Godliness Skiffle Band, Chet Helms (MC). Lights by Optics Illusion. 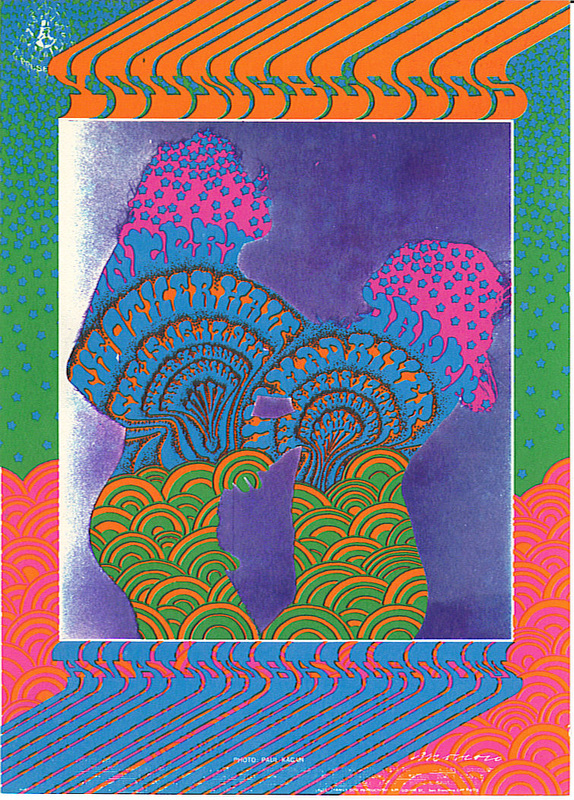 Also on the bill: Moby Grape, It's A Beautiful Day, Tim Hardin. Lights by Jerry Abrams Head Lights. One show each day, from 9:00pm to 2:00am. The Other Half broke up. 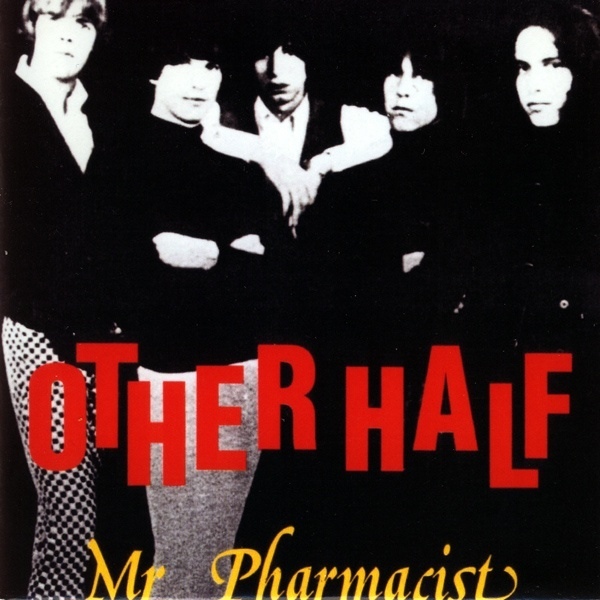 The Other Half's anthology album, 'Mr. 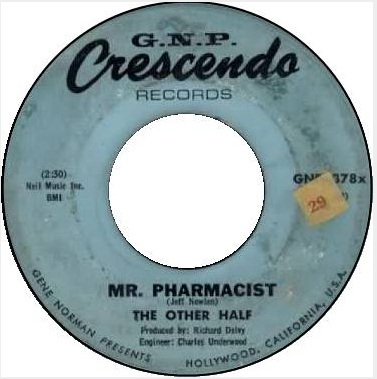 Pharmacist' (EVA 12003; tracklist: 'introduction / Feathered Fish / Flight Of The Dragon Lady / Wonderful Day / I Need You / Oz Lee Eaves Drop / I've Come So Far / Mr. Pharmacist / Bad Day / Morning Fire / What Can I Do For You, First Half / What Can I Do For You, The Other Half / No Doubt About It / It's Too Hard (Without You) / I Know'), was released only in France (both in vinyl and compact disc format).